Martha Raye died on this date in 1994. What was her maternal grandmother's maiden name? Martha Raye was born Margaret Teresa Yvonne Reed, to Parents Peter Reed and Maybelle Hooper. Margaret (Martha) and her brother Buddy are on lines 79 and 78 respectively. Still looking for Maybelle's mother's name. This again said her mother was a Hooper and that her Mom's name was Maybell. Father Peter F Reed. I found references to the siblings of Martha as Bud and Melodye (also her daughters' name). I found a Melodye Reed listed as a grandchild of Jacob Kleinhans in Cascade Co MT in 1930. In the 1910 Cascade Co MT census, Jacob had a daughter named Mabelle living with him and his second wife. (coincidence or the cause of my rat hole?) I couldn't find a Hooper I liked, so I followed the Kleinhans. An older child was born in Michigan, so I found Jacob's first wife was Mary. Both Mary and Jacob were born in Germany, and Mary supposedly arrived in this country in 1876. Which leaves me to the final tunnel in my rat hole - in trying to find a maiden name for this non-Hooper Kleinhans family wife, the Mary born in Germany closest to the age of this Mary in Michigan, was Mary Staals in the 1880 Portage, Houghton Co MI census. I hope someone found the Hoopers - wow, that was a long, wrong way trip, but I decided to post it anyway to show my Friday night entertainment!! This is just a guess. All three of you have found important clues, but one remains to be found. 1) Martha's birth certificate is correct about her mother's name. 2) Maybe Maybelle Hooper wasn't called Maybelle Hooper in 1900 or 1910. There is a Hazel Hooper, born in MT at the right time, daughter of Samuel and Theresa, who are both born in Michigan. It's possible that somehow Hazel was elided to Maybelle, but I can't find a confirmation of that, but I think it's worthy of note that Maybelle did appear in the census as Maybelle H. Reed, although this may simply stand for Hooper. Unless I'm reading the years wrong, the children are much too young to be Mabell, however Mabell appears as Mabell H in the 1920 Chicago Census (which could be Hazel). If Samuel died, and Theresa married Jacob that would explain why the Mabell appears as a daughter to Jacob Kleinhans in 1910.
, Mary 25 f w keeping house England? which is the SAME county that Jacob Kleinhans was from, but I don't find this family in Montana so can't place a Mabell with them. 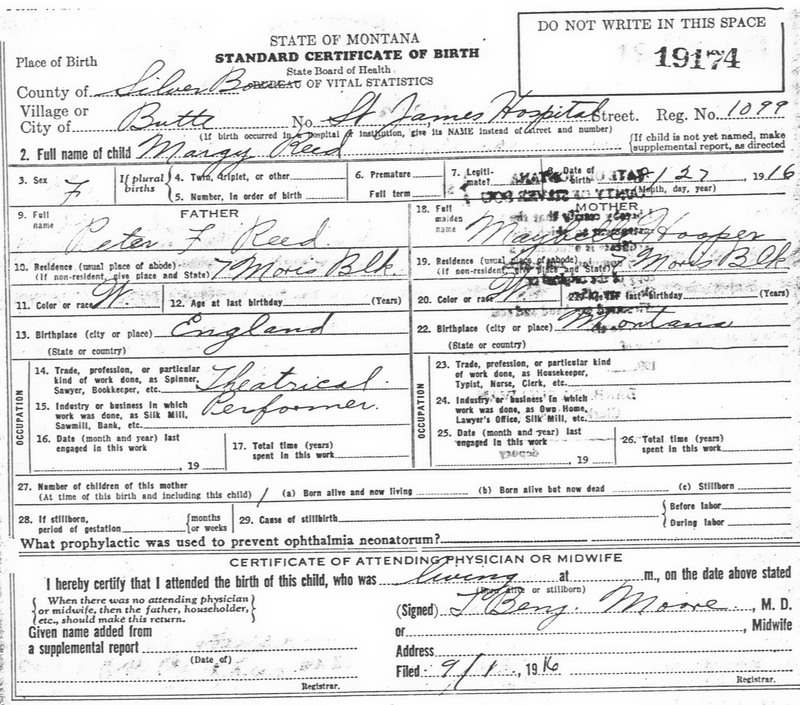 My kingdom for marriage or birth records in Montana!!! 1905 census has Jacob and Theresa Kleinhaus, living in Wisconsin, with daughters Florence, MABEL and Dorothy. This is looking more and more like our family. Dorothy Kleinhaus was born Dec 1901 in Milwaukee, WI. Anyone have access to Milwaukee birth records?? Deb, I like your first theory, and at least part of your second. The answer does lie in Houghton County, Michigan. The Samuel Hooper listed in the 1870 census was a miner, and I found an entry on the Houghton USGENWEB site of a Samuel Hooper dying in a mining accident 23 Nov 1871, leaving 2 children (Portage Lake Mining Gazette), so that leaves little Mary and Samuel on their own with mom Mary, so Samuel (the son) could have married before Theresa, but I'm throwing in the towel. Mabell has eluded me. Hope someone can take any of this info and solve the mystery. If the Hazel Hooper from 1905 is indeed our Maybelle, then that tells us that her grandparents were born in France and Germany. Taking your clue that Houghton, MI is signficant, I went looking for a Theresa born about 1875 in Houghton, with parent from France and Germany. There are a couple of close matches: Theresa Sausergren , right name, right age, right place. Her parent's origins are reported as France and Alsace (which swung between France and Germany). Also Theresa Bernung, whose parents are both recorded as being from Elsass (Alsace), although her DOB is 1868, which is a bit early for our speculations. Theresa Pinkleman, both parents from Prussia. But I can't find any concrete evidence to tie any of these to Samuel or Hazel/Maybelle. Her father is named Anton, mother recorded as unknown. The Theresa Sausergren of the previous post had a father named Anthony, so I think we've got the same individual. "Sanusehagrin" and "Sausergren" look like misspellings or mistranscriptions to me. How should the name be spelled? In the 1910 and 1920 census, Mary Sanschagrin is living in Houghton County, Michigan with her daughter Elizabeth and her son-in-law. I think you're right. It's the French translation of "Hakuna Matata." That Chicago census is actually from 1930, so the age of 32 also fits. I haven't found the family in the 1920 census. You're right. I had written 1920, but it WAS 1930. Looks like a plausible circumstantial case for Hazel being Mabelle. "Plausible" and "circumstantial" describe most of my genealogical conclusions.